A super impressive (and surprisingly easy!) 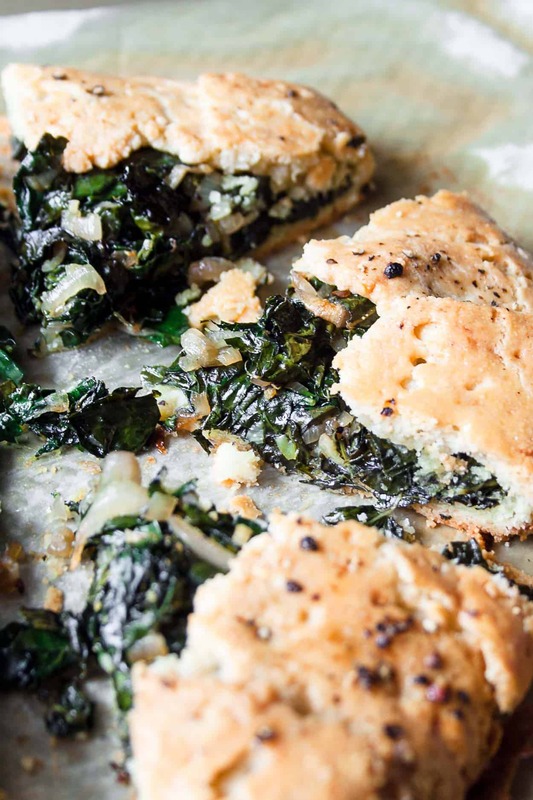 garlicky kale galette that is a perfect main course for vegetarians or a gorgeous side for Sunday brunch. 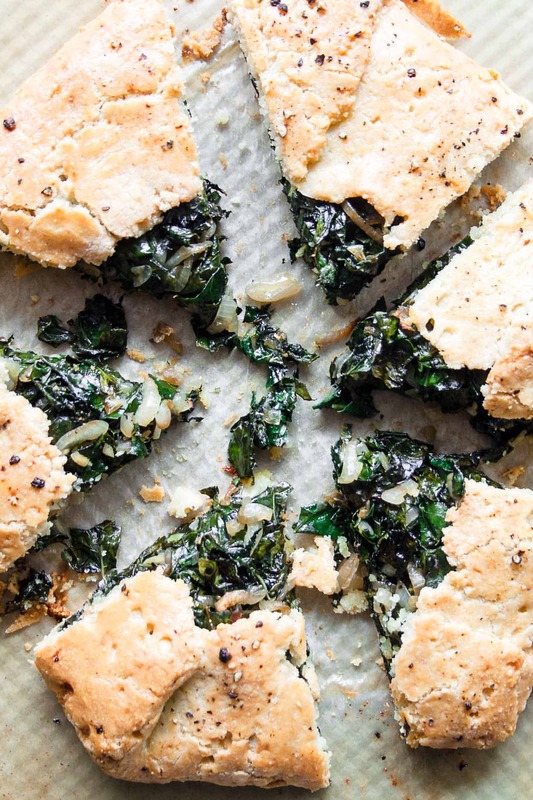 Made with a four ingredient almond flour crust that comes together in your food processor and a kale filling that is sure to impress your family and friends! This recipe could also be called: FALL IS ALMOST HERE. I know I shouldn’t be talking about fall when summers in Chicago are literally the only reason people live here. Ok that’s not totally true, but it is about 75% true. And while most Chicagoans never want summer to end, I’m over here like ‘fall cannot come soon enough’. I guess I’m pretty *basic* when it comes to fall being my favorite season… the big cozy sweaters, cool crisp air, football on Sundays, and obviously fall food. I love baking things in the fall. It feels good to finally turn on my oven after months of avoiding it at all costs. 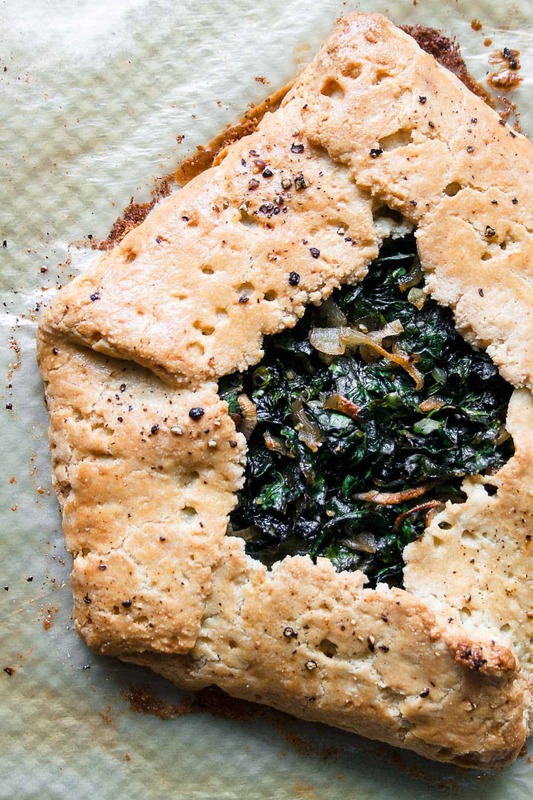 And this Garlicky Kale Galette is worth turning on your oven – even if it’s not quite fall yet! They’re essentially a pie without the pie plate. You can put literally anything inside! Sweet or savory. They can be the start of the show, a side, or a dessert! I mean, you really cannot go wrong with a galette. And I know you are going to love this one! 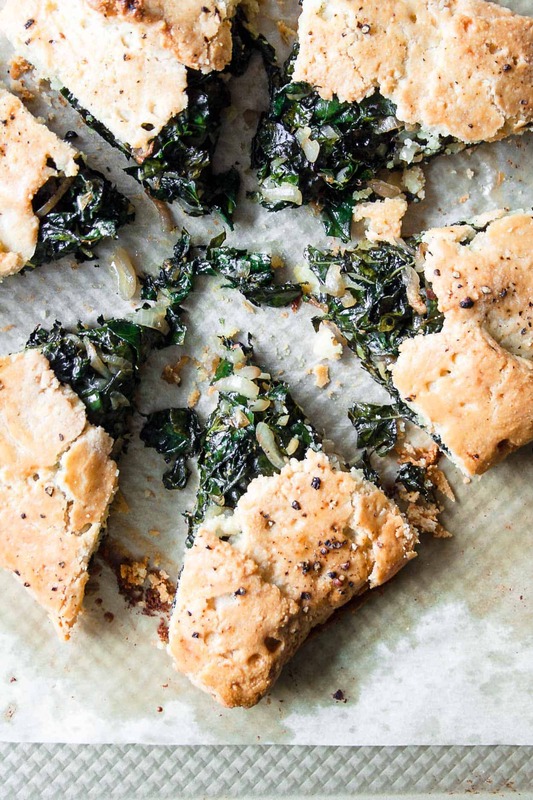 Make this Garlicky Kale Galette for brunch this weekend and post a picture on social media and use the hashtag #imhungrybynature for a chance to be featured! Make the crust: In the bowl of a food processor fitted with the “s” blade, pulse the almond flour and salt together several times to combine. Add the butter, and pulse several times until the butter pieces are the size of small peas. While the machine is on, pour in the water and egg white and continue to process until the dough comes together in a large ball or mass. Scrape down the sides if needed. Turn out the dough ball onto the parchment lined baking sheet. Top with another sheet of parchment, and roll into a disc about 1/4″ thick. Chill the dough in the fridge while you make the filling. Make the filling: Heat olive oil in a pan over medium heat. Add shallots and saute until soft and just translucent, about 5 minutes. Add garlic and saute for another minute. Finally, add kale and saute until it begins to soften, adding another 1/2 Tablespoon olive oil if needed. Place the filling to the center of the crust, leaving about a 2 inch ring around the border. 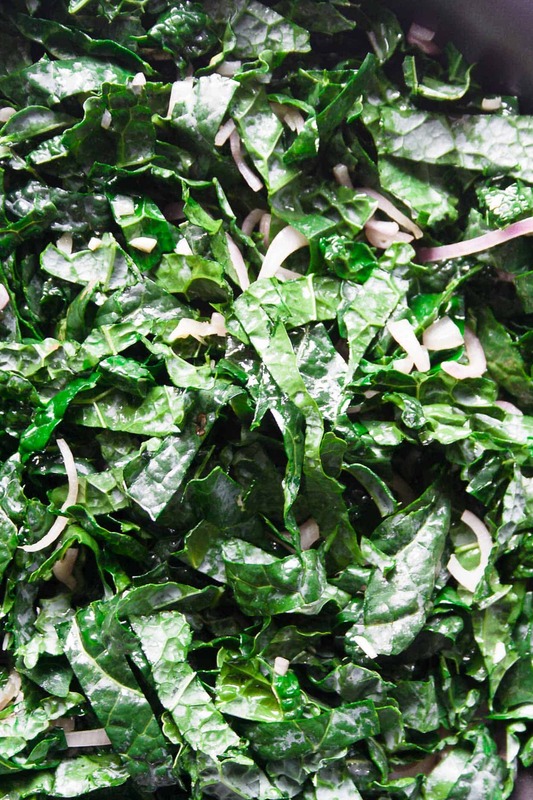 Pick up one corner of the parchment beneath the dough, fold the empty dough over the kale mixture. Continue to do this around the entire galette until all the extra crust has been folded over the mixture. Mix together the ingredients for the egg wash and brush over the surface of the crust. Sprinkle with salt and pepper. Bake for 30-40 minutes or until crust is golden brown.